Last week, we took a look at the first few chapter of For Cause & For Country. Author Eric Jacobson gave us the background of the war in the west and set the stage for Hood’s Tennessee Campaign in Chapter 1. He moved on to the initial stages of the Confederate advance into Tennessee all the way to Columbia on November 29, 1864 in chapter 2, and now we are poised to get into the meat of the book. This is where it gets very interesting, because now we can take a look at how Wiley Sword and Eric Jacobson interpret the confused events of November 29, 1864 at Spring Hill, and I am greatly looking forward to finding these differences. Note: If you haven’t already, I highly suggest reading Part 1 of this series right now, before moving on below, to get a feel for Wiley Sword’s version of events. 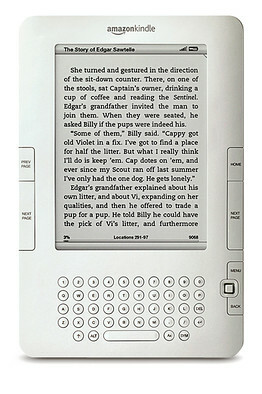 I’ll also be pointing out differences in the text below. Did the Confederates understand what their objective was on November 29? Was Hood simply trying to get to Nashville before Schofield or was he trying to eliminate Schofield as a fighting force? The author says it is impossible to tell for sure at this late date, but he concludes that the most likely goal was the latter. He bases his conclusions on the recollections of S. D. Lee and other commanders in Hood’s army. Hood further believed that if he could defeat Schofield, then Nashville would fall without a fight. “It seems obvious”, says Jacobson, “no matter how flawed Hood’s opinion about Nashville may have been, that he wanted to try and erase Schofield from the field” on November 29, 1864. The list of Confederate problems in accomplishing this feat soon grew. As in Sword’s book, Jacobson relates the story of how the road to Spring Hill, only 12 miles on the map, was actually a poor, rutted, winding 17 mile long route that would significantly delay Hood’s army. Second, around 10 A.M., Hood’s men met portions of Sidney Post’s reconnaissance sent east by Schofield earlier that morning. This caused Hood to change his marching alignment, splitting Cheatham’s Corps into two columns marching side by side. Further, he had Brown’s Division march in the woods and fields off the column’s flank. Naturally, this slowed the column down even further. While Sword and Jacobson agree that this was done and that it slowed the column down, Jacobson makes no mention of Sword’s belief that the possibility of Union troops along the line of march “was to have a profound effect on his thinking during the remainder of the day.” Clearly he simply believes Hood was being prudent when faced with the fact that he might be hit with a flank attack while in march formation. Stonewall Jackson did much the same thing on September 1, 1862 as he was marching east to cut off Pope’s combined Union army from Washington, D.C. In Jackson’s case, he was lucky to have done so, given the fact that Isaac Stevens and Federal forces under his command launched an aggressive attack on his right flank. To me, Sword’s view of events seems to be too much affected by hindsight. What if Hood HADN’T taken this precaution and Schofield HAD attacked in that direction? I get the feeling many authors would have called Hood out for not doing what he did in that event. Nathan Bedford Forrest had meanwhile given the Confederates a huge advantage. He moved north forcefully up the Lewisburg Pike, parallel but east of the Confederate infantry. Wilson’s Union cavalry remember, was guarding this road rather than the roads to the west taken by that Confederate infantry. Wilson used delaying actions against Forrest as he slowly retreated north first to Hurt’s Cross Roads and then to Mt. Carmel. Forrest continued to push until he got to Mt. Carmel, only six miles east of the objective at Spring Hill. Wilson obviously did not believe Spring Hill to be the goal of the Confederate cavalry, and he retreated north on the Lewisburg Pike at 10 A.M. on the morning of November 29, clearing the way for Forrest to move west and get astride the Yankee line of retreat. Forrest did send General Lawrence Ross and his small brigade after Wilson to give the impression of a continuing advance, but he took the other 4,500 men of his command in the direction of Spring Hill. Wilson was completely separated from Schofield at this point, and neither knew where Forrest was. Whether or not the Confederates could take advantage of this edge remained to be seen. Schofield continued to vacillate, even as reports came in from Post that the Confederates were in force on his flank and moving north. He was convinced that this was a feint due to the activity in his front. S. D. Lee, with his two infantry divisions and most of the army’s artillery, was doing an excellent job in deceiving the Union general. David Stanley finally was ordered to head north at 8:45 A.M., guarding the Northern wagon trains and 40 pieces of artillery with George Wagner’s Second Division and Nathan Kimball’s First Division. Schofield again changed his mind, however. He ordered Kimball to guard a crossing at Rutherford’s Creek, four miles north of Columbia. Stanley, one division of his IV Corps, and a portion of the army’s artillery were all the reinforcements that would arrive at Spring Hill in a timely fashion in case of a Rebel flank attack. Spring Hill it self was at this time lightly defended. The 12th Tennessee Cavalry (Union) was initially the only unit in town, but it was soon joined by the 3rd Illinois Cavalry and the 11th Indiana Cavalry. They had been ordered from their posts west of Columbia to come to Wilson’s aid at Mt. Carmel. These cavalry regiments soon learned that Forrest was east of town, and they moved out to face him. Several infantry regiments, including the 73rd Illinois and 103rd Ohio, now also joined the cavalry in defense of the town. They were the leading elements of Stanley’s column. From 11 A.M. to noon, Forrest slowly but surely pushed the Yankee cavalry to the eastern outskirts of Spring Hill. He was ready to finish the job and take the town and the wagons he could see moving through, but by this time the spare Federal infantry had built breastworks east of town. They were joined there by the retreating cavalry, and also by two Union batteries of artillery. Forrest, still believing he was only facing cavalry, ordered Chalmers to take a force to attempt to drive these troops back and take the town. Chalmers knew better, and asked Forrest call off the attack. Forrest refused, Chalmers’ men were hit with a heavy fire, and they had to retreat. Forrest admitted to Chalmers that he had been wrong, and the Confederates were stopped for the moment. To make matters worse, Federal infantry brigades were starting to arrive in force. David Stanley had received word of the fighting in Spring Hill around 11:30 A.M., and he sent Wagner’s Division ahead quickly. Opdycke’s Brigade reached Spring Hill around 12:30 P.M., and they took position north of town and west of the Franklin Pike. Lane’s Brigade arrived next, and he moved his men due east of Spring Hill, taking up positions formerly held by the hodgepodge force of Federal cavalry and infantry guarding the town. Last to arrive, around 2 P.M., was Bradley’s Brigade. He set up his men on a ridge southwest of town, guarding any advance up the Rally Hill Pike. Bradley pushed out the 64th Ohio as skirmishers, and they advanced far ahead of the main line. They soon came scrambling back, pushed by Tyree Bell’s Cavalry Brigade of Forrest’s Corps. At this point, Bradley tried to strengthen the far right of his line, and Opdycke’s Brigade was shifted from the west side to the east side of the Franklin Pike, better connecting with Lane on his right. Forrest continued to keep up some pressure, but he knew that at this point his only hope was to wait for the arrival of Hood’s infantry. Wagner’s Division had arrived literally in the nick of time, says Jacobson. Had they been even minutes later, Forrest may have been able to take Spring Hill. Hood’s infantry had halted around noon to take a break and eat, and Hood had what Jacobson calls a “heated argument” with brigade commander Hiram Granbury about the slow speed of the march. The author, in a viewpoint opposed to Sword’s, says that after it became clear Post’s reconnaissance was only that and not an attack, Hood picked up the speed of the march. His men reached the intersection of the Davis Ford Road and the Rally Hill Pike by “mid-afternoon”, an area only several thousand yards southeast of Spring Hill. Hood himself reached the Spring Hill area around 2:30 P.M. He heard Lee’s artillery fire in his rear at Columbia, trying to hold Schofield in place. However, he also heard muskets and carbines to his front at Spring Hill, and he wondered what fighting was going on there. before the day was over things would go terribly wrong for Cheatham. There would forever be more questions than answers about what happened and the maddening gaps of information led to a plethora of stories and accusations. For decades after the fighting stopped Spring Hill was a focal point of debate and Cheatham, along with his hapless commander John Bell Hood, were the men at the center of the controversy, immersed in a drama that had unfolded one confusing hour after another. At this point, contradictions in the various reports abound. The first controversy of the day involved Hood and Cheatham. Hood recalled that around 3 P.M. he had pointed out some wagons along the Franklin Pike and ordered Cheatham to “take possession of and hold that pike at or near Spring Hill.” Cheatham denied this ever happened, and Jacobson backs his claim. First, there were no wagons on the southern end of Spring Hill around this time. Second, it is doubtful Hood and Cheatham could even see the Franklin Pike from their position at 3 P.M. Jacobson next discusses the alignment of Cleburne’s Division. Agreeing with Sword, the author says that this alignment en echelon clearly shows that Cleburne was supposed to cut the Franklin Pike and then face south towards Columbia. Bate, another of Cheatham’s Division commanders, strengthens this claim by recalling that Hood had ordered him to face SOUTH once he reached the pike. Further, Bate says Cheatham gave no orders at this time. Cheatham recalls events differently, remembering that Hood directed him to move north and face Spring Hill, and that he also ordered Bate to align himself on Cleburne’s left. Jacobson seems to discredit this memory as faulty, and he does not go into the rather strange supposition of Sword involving Hood first ordering his men to face south, and almost immediately changing his mind and ordering an attack on Spring Hill, all without telling Cheatham of his plans! Jacobson’s version of events to this point seems more plausible to me, at least. At Columbia, John Schofield finally decided to retreat around 3 P.M. His indecision disappeared quickly when he heard firing in the direction of Spring Hill. 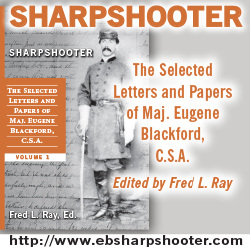 At 3:30, he led Ruger’s Division north to come to the aid of those troops then defending Spring Hill, and he gave orders to the rest of his command to oppose Lee the rest of the day and only leave at nightfall! Clearly Schofield did not fully appreciate the true danger he was in, even at this late stage of the game. Lee saw that some Federal troops were leaving, and by midday he had started to force a crossing of the Duck River. Several regiments of Pettus’ Alabama Brigade attacked two Kentucky regiments acting as the Federal rear guard and drove them back several hundred yards. Neither side suffered many casualties, though Lee did lose his artillery chief Robert Beckham to a stray shell. I’ve noticed several differences of opinion already between Jacobson and Sword, most of them involving Hood. The most important of these include Hood’s state of mind after discovering Sidney Post’s reconnaissance and what happened shortly after Hood formed his initial plan of attack. In both cases, Jacobson is at worst neutral to Hood, while Sword paints him in the worst light possible. These differences aside, the two authors mostly agree on the rest of the day’s events up to 3 P.M. I assume they will begin to diverge as I move through Chapter 4. I wanted to take a moment to note that I have really enjoyed the book so far. This is a fine battle study with detailed tactical descriptions. 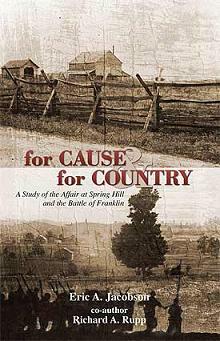 Jacobson covers only the battles of Spring Hill and Franklin in a book of slightly over 500 pages. Sword covers the entire campaign in just under 500 pages. It is obvious that Jacobson, with his more narrow focus, is going to go into greater detail as far as these two battles go. That ends this week’s rather short entry. I apologize that I wasn’t able to get a few more chapters into this one and I’ll try to make up some ground next week. My lack of progress has nothing to do with my interest level in the book. On the contrary, I’ve been following along with great anticipation, looking to find the differences between the two books. It was simply a bit of a hectic week in real life. As always, comments are welcome and encouraged.